He is now suing George Clooney, Rande Gerber, their former tequila brand, the Beverly Hilton and others for damages of up to $20 million. A Los Angeles man claims his life turned into a 'living hell' after he ordered a trendy liquid nitrogen-laced tequila at a high-end Beverly Hills hotel from a brand then owned by Hollywood star George Clooney and his best friend Rande Gerber. 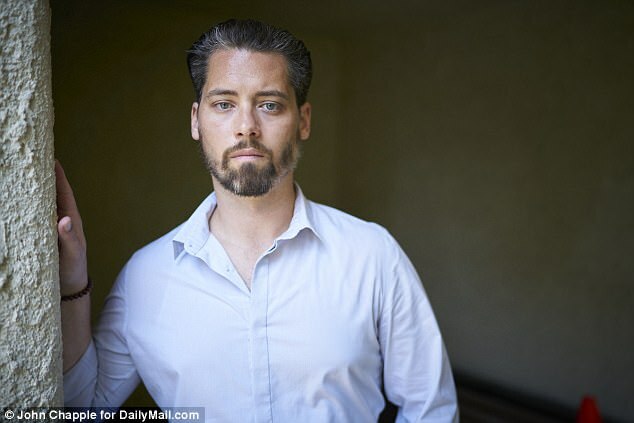 And now 35-year-old Jeremy Cox, who collapsed in agony at the luxury four-star Beverly Hilton Hotel after downing the smoking cocktail that his attorney calls 'poison', is suing Clooney, Gerber, Hilton hotels, Casamigos Tequila, events supplier Southern Wines and Spirits and others for up to $20 million for negligence and battery. DailyMail.com has reached out to Clooney, Gerber, Casamigos, the Beverly Hilton and Southern Wines and Spirits for comment but have yet to receive any response. Cox relived what happened on August 21, 2015 when what should have been a romantic night out with his wife of six years, Jessica, 42, turned into a terrifying nightmare. The couple - who live in Los Angeles with their two sons, Kingston, five, and Zen, three - were thrilled when their friend, DJ Michelle Pesce, invited them to a glittering party to mark the 60th anniversary of the Beverly Hilton, where the Golden Globes Awards are held every year. 'Because Zen was still very young and we hadn't really been out together since he was born, this was a big deal for us. We were both very excited,' said Jeremy, who wore a smart suit while Jessica wore an elegant blue dress for the special occasion. They wandered around the party - set on the concrete patio around the Beverly Hilton's famed swimming pool - sampling the lavish, 60-foot-long spread of food and sipping cocktails, until Jessica spotted a woman at one of the bars, with smoke coming from her mouth after she drank a cocktail. 'When I saw her blow out this puff of smoke I thought: 'That looks cool.' I've seen it on reality shows on TV,' said Jessica. The couple went to the bar and asked the bartender to try one of the drink samples on the bar. 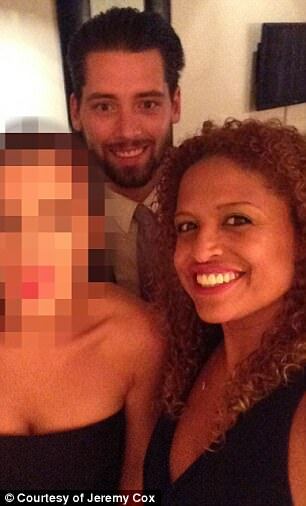 'Of course we said yes,' added Jeremy, who's a financial analyst with a Los Angeles medical group. 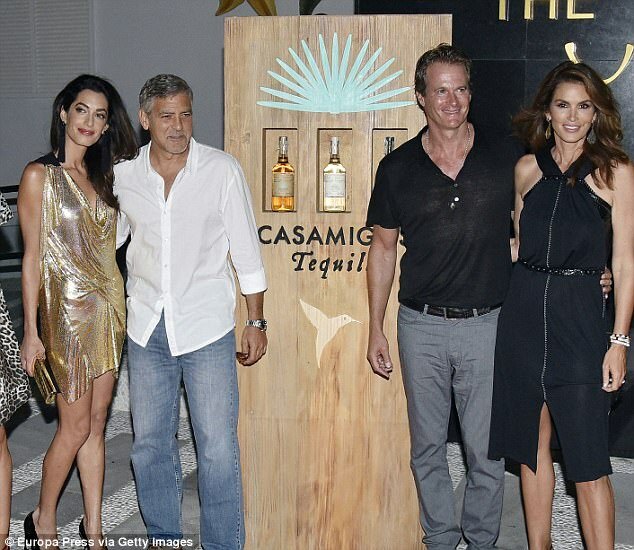 Jessica watched the bartender make each of their 'special' cocktails using Casamigos tequila from the company founded in 2013 by Clooney and Hollywood nightclub and restaurant mogul, Gerber, who is married to supermodel Cindy Crawford. 'She took what looked like an ice chip - which the bartender said was frozen tequila - and put it into a copper shot glass,' remembered Jessica who was blissfully unaware of the damage the concoction being mixed for her and her husband could do. 'Then she took a bottle of tequila and poured some into each glass. And, after that, she took a pitcher of another liquid which was smoking and poured some into each shot glass. 'We didn't know what it was it at the time but that was liquid nitrogen,' said Jeremy. 'All she said to us as she handed us the drinks was, 'You have to drink these right away.' She said that two or three times. While Jessica hesitated before taking a small sip of her smoking drink, Jeremy downed his in one gulp. He recalled: 'Instantaneously I had this sensation of terrible pain from the back of my throat all the way down to my stomach. It felt like frozen fire. Jessica still shudders when she remembers the look of agonized terror she says she saw on Jeremy's face. 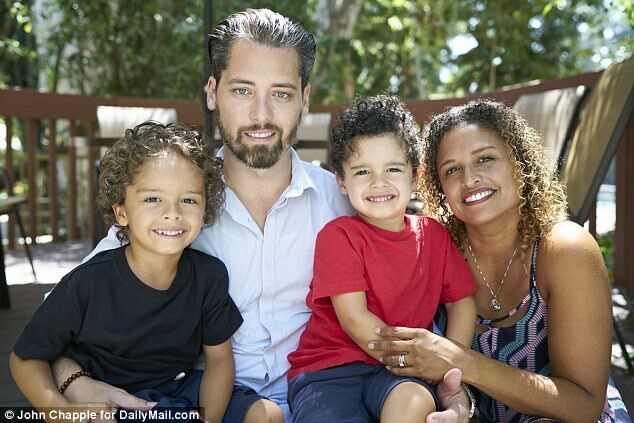 'He looked at me and I knew immediately that there was something terribly wrong,' Jessica told DailyMail.com. 'He looked very pale and he was gasping. Then, Jessica said, he fell straight over backwards: 'I remember the horrible, dull thud as the back of his head hit the concrete floor. 'It was the loudest, most terrible sound I have ever heard. There is growing concern about the increasing use of liquid nitrogen in cocktails and the ignorance of the public about just how dangerous the practice can be. Drinking liquid nitrogen, which is as cold as -320.44°F to -346°F, can cause severe internal cold burns and obliterate the stomach. Basically, consuming too much of the substance can cause an internal frostbite that destroys stomach lining. Liquid nitrogen is commonly used to freeze warts so they fall out, meaning it is used to kill tissue. The same is possible if ingested because the human body is not designed to cope with that degree of cold. This happened to 18-year-old Gaby Scanlon in Lancaster in 2012. She drank two 'Nitro Jagermeisters' and was rushed to the hospital after telling her friends she was in excruciating pain. She told Daily Mail: 'I'd been warned by the barman the drink might make me a bit gassy, so I didn't think too much of it, but then my stomach started to expand and I felt sick. Because the low temperature burned a hole in her stomach and destroyed her stomach lining, she had to have it completely removed. Surgeons connected Scanlon's esophagus, the tube which takes food from the mouth to stomach, directly to her small bowel. A 2014 article in the British Medical Journal headlined 'A lethal cocktail - co-written by James Scott Pollard of the Royal Lancaster Infirmary's department of surgery in U.K. - laments the lack oversight of the potentially hazardous concoctions. 'Recipes are available on the internet and such drinks are increasingly sold in some incensed premises,' he wrote. 'Use in this way requires no training and sales are unregulated. 'We report this case to raise awareness among the public and medical services of the potential dangers of using liquid nitrogen this way. 'I tried to find a pulse but I couldn't. 'His eyes were open but they were frozen, not moving, just staring. He looked dead - not one part of his body was moving. He remembers being dragged out of a back exit by security guards to a loading dock where on-call paramedics were waiting. 'They sneaked him out of the party because they didn't want anyone to see him in that condition,' claims Jeremy's lawyer, Aaron Filler. After Jeremy's collapse - which happened at around 9 p.m. - he was taken to a nearby emergency room where, he said, he was diagnosed with gastrointestinal issues and serious head trauma before being released at 4.30 a.m..
'Then I had to go through two endoscopy procedures which diagnosed that I had stomach trauma and ulcers, plus a bruised esophagus,' he added. It was through legal discovery documents provided as by the defendants, said his lawyer, Aaron Filler, that Jeremy found out that Kristin Clark, the bartender who served him the fateful cocktail was a Los Angeles-based marketing executive with Casamigos Tequila. 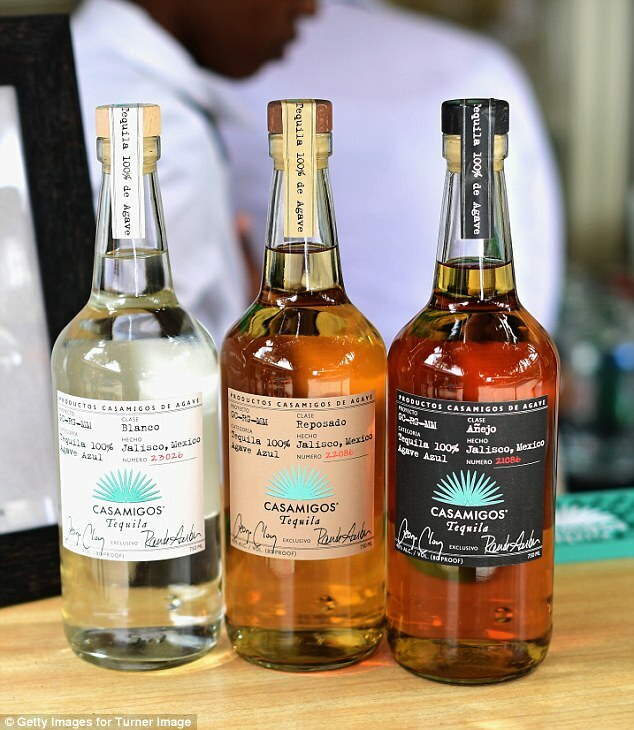 'These Casamigos marketing executives are usually pretty women who are employed to promote the drink and are used to pouring Casamigos Tequila at lots of events,' claims Filler. 'The trouble was on this occasion, the bartender involved had no previous experience using liquid nitrogen. Jeremy claims he couldn't work for weeks after his ordeal almost two years ago. 'I couldn't get out of bed - it was a nightmare,' he said. 'I was in constant pain in my chest, stomach and neck every minute of every day. The bruise I had on the back of my head was the size of a baseball. I had diarrhea for a year after that night. 'I couldn't eat any solid food because it was too painful. 'I was hungry all the time. After a couple of weeks I tried some mashed potatoes that Jessica made for me. I took one bite and it felt like I'd eaten broken glass. I could feel it burning the whole way down my esophagus into my stomach. 'I'm still in pain all the time. I've been in and out of doctors' offices. I've had surgery, two endoscopies, a colonoscopy, lots of invasive medical procedures and tests. Lots of medications - one of them made my hair fall out. Jeremy explains that before that night he was happy, healthy and active. 'Jessica and I loved traveling and outdoor activities,' he said. 'I was always playing with the kids. 'Now I can't do any of that because of the pain I am in every day. I can't lift up the boys or climb or play with them like I used to. 'They want to keep on playing with me like that but I can't do it because I'm not the man I was. It's heartbreaking because my family means everything in the world to me. 'Now I'm a broken, diminished man.'. 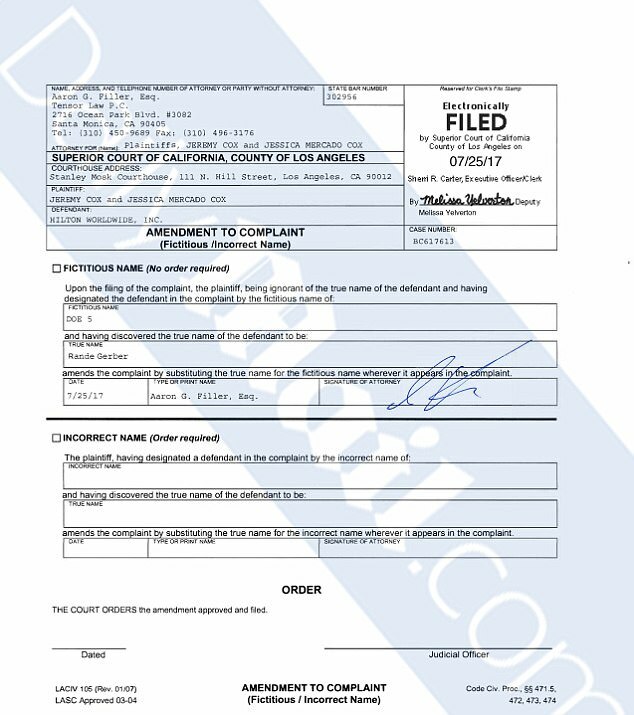 Jeremy and Jessica's original lawsuit called for damages for negligence, negligent infliction of emotional distress and negligent hiring, supervision and retention, against the Beverly Hilton. 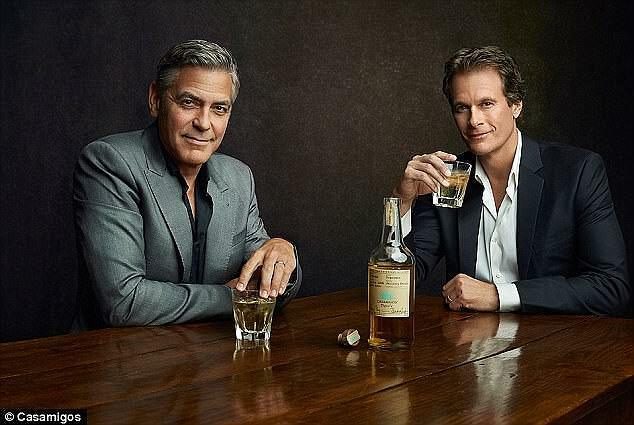 After discovery, he later added Casamigos Tequila - which Clooney and Gerber sold last month to British beverage giant Deagio for up to $1billion - and the event's alcohol supplier, Southern Wines and Spirits. Now Clooney and Gerber have been added to the amended lawsuit. 'There's a lot of blame to go around,' Jeremy said. 'I blame the Hilton. I blame Casamigos. I blame Southern Wines. They should pay for what they did to me. Knowing what I know now, decisions were made by employees of several big companies and those decisions resulted in this happening. Jeremy's lawyer, Aaron Filler - who is also a neurosurgeon - maintains that expertise is required to serve drinks that contain liquid nitrogen. 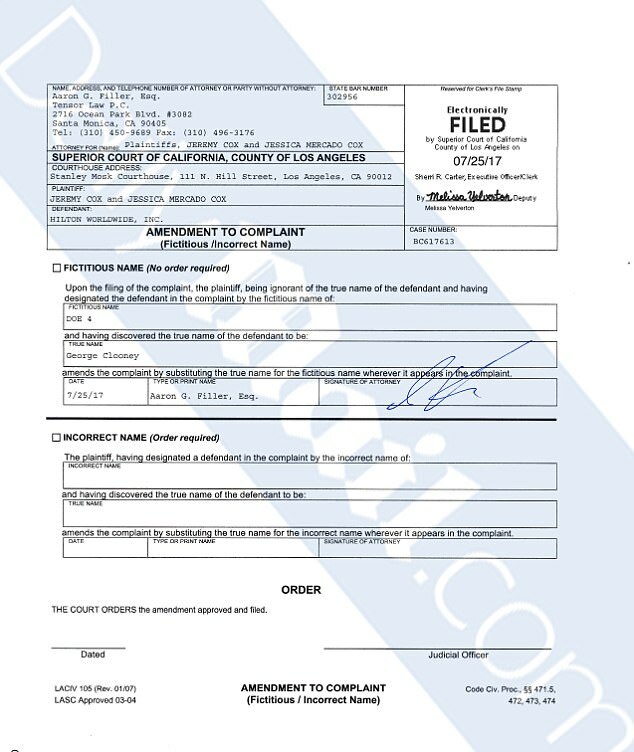 Filler claims emails sent between Casamigos, the Beverly Hilton and Southern Wines and Spirits before the party show that they all knew about the hazards of liquid nitrogen. He said: 'Nobody warned Jeremy that if you drink liquid nitrogen, instead of waiting for it to evaporate in the smoky way that makes it so popular, it can cause severe burning and trauma to the gastrointestinal system. While Cox's original lawsuit against Hilton demands $1 million in actual damages, Filler told DailyMail.com that he is in the process of filing a modified lawsuit against the partiesfor punitive damages of up to $10 million. What an awful thing to happen. If the bartender making the drink had not been a Casamigos employee I guess this wouldn't be an issue for the company, even if the drink was made with their tequila. But it does seems that Casamigos is liable on some level along with the Hotel. I was at a Mexican restaurant recently and I saw a diner exhaling smoke after sipping a drink through a straw and wondered what the heck she was drinking. It was a specialty cocktail that I guess was made with liquid nitrogen. It's a gimmick and IMO a really stupid one. At first I was wondering why George was being dragged into this. The bartender could have used any brand of tequila - or any other kind of liquor, for that matter. Not George's fault. Then I read that the bartender was supplied by Casamigos. Case closed. Having employees serve potentially physically damaging , possibly lethal, drinks is incredibly irresponsible. The possibility to cause harm should be enough of a reason not to do this - no matter how "cool" it is or how many stupid people want to try it. They should know better. I guess now they will. I haven't read all the article, so I'm not so sure of what I'm saying, but if the client ordered a liquid nitrogen-laced tequila, knowing that it was made with liquid nitrogen, and then felt sick, isn't a little bit his fault, too? I thought about that too Doug Ross. I would guess that using liquid nitrogen in cocktails is allowed but it must be used in a responsible way. I would also think the bartender is responsible for ensuring appropriate use in their drinks. If bars and restaurants are going to use potentially harmful ingredients in their drinks/food then I think the onus is on them to ensure customer safety. I wonder if there are government regulations out there pertaining to the consumption of liquid nitrogen in public establishments. Isn't liquid nitrogen available for sale in the general marketplace? Honestly I'm really not sure what the legal ramifications are. I've never heard of something like this happening. According to the article the customer wasn't given instructions or warned in any way to be careful. The bartender should have at least told him to sip slowly, but she didn't - at least according to the man and his wife. IMO there's no reason for anyone to be serving drinks like this. The risks are way too great. Quick chemistry lesson (because, shockingly, the Daily Fail forgot to mention this): there's nothing wrong with nitrogen. It's an inert gas that humans don't react to (it makes up close to 80% of the air we breathe). The problem here is that nitrogen in its liquid state is incredibly cold, around -200c or -300f. Touching it, or swallowing it causes an instant and very deep freezing of human skin and tissues, as you'd expect. 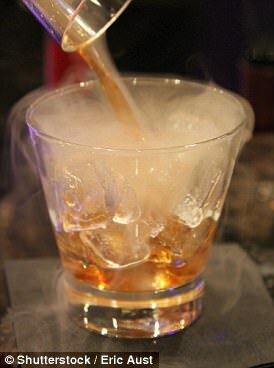 We've often used liquid nitrogen with food and cocktails - but only as a decoration (the 'smoke' is really pretty). All of our waiters know that you don't put your fingers anywhere near the 'ice' chip that's causing the smoke! If you work in the food industry, you know that this stuff is far too cold to ingest (it's the same stuff they use in some restaurants to make 'instant icecream' because it chills to such low temperatures). 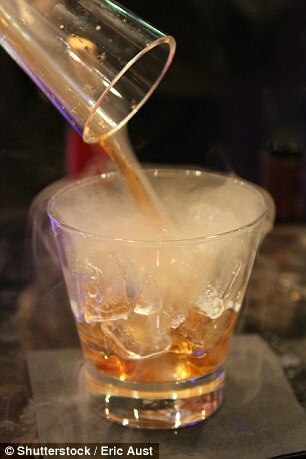 We do serve smoking cocktails here, but we're using actual smoke, not liquid nitrogen! As for the Casamigos responsibility, hmmmm. I guess this is their fault for going for grandiose job titles, so Marketing Executive instead of Cocktail Waitress. And for not ensuring people serving drinks were trained mixologists.